Of the estimated 17.4 million new Android and Apple phones and tablets unwrapped on Christmas day, nearly half snagged a copy of Rovio's bird-powered physics puzzler. It sure pays to be nearly synonymous with mobile gaming, doesn't it? 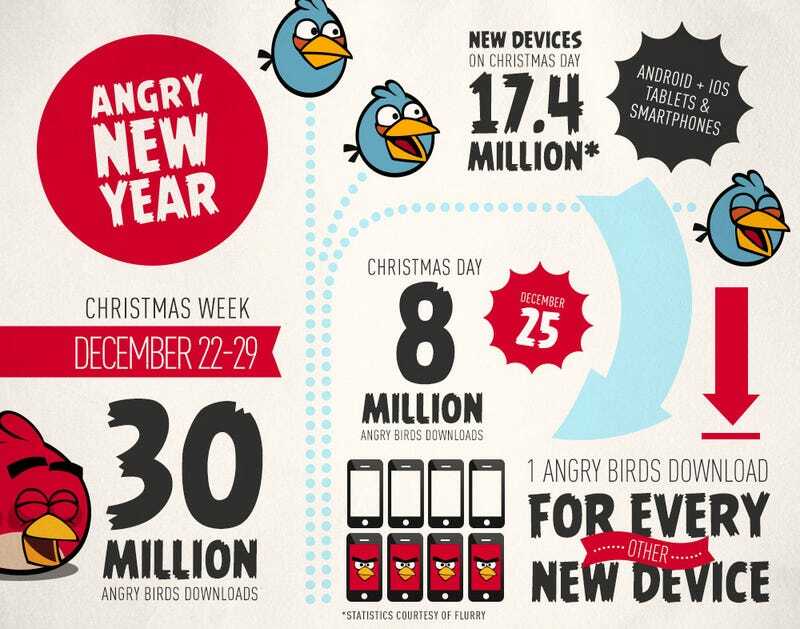 Using statistics gathered by Flurry.com, Rovio celebrates another year of Angry Birds success. 2012 saw the launch of two new wildly successful entries in the mobile game series (Bad Piggies and Angry Birds Star Wars), as well as the launch of the Angry Birds and Angry Birds Star Wars Facebook games. With the Angry Birds movie coming in 2016, count on at least another three years of new games, updates, and end of the year infographics. 30 million downloads in one week. That's insanity.